Bridging the gap between good design and giving back to the community, Canstruction, the annual international design/build competition where architects, engineers, designers, and students compete to design and build gigantic structures made entirely from full cans of food, is coming to New Jersey in October! The AIA New Jersey recently announced the 11th annual New Jersey Canstruction competition will take place in October at the Prudential Center Arena in Newark to support the Community Food Bank of New Jersey – the state’s largest distributor of food to non-profit organizations serving people in need. To celebrate this year’s location, all structures will inspired by hockey, The New Jersey Devils , The Prudential Arena Building, or the City of Newark. 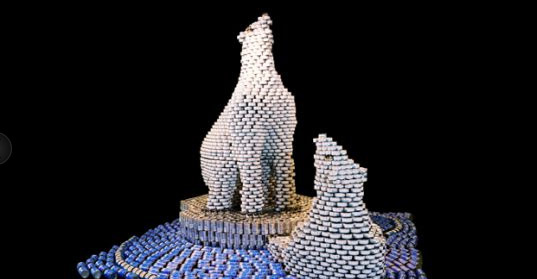 Sponsored by the Society for Design Administration , an affiliate of the American Institute of Architects , the competition will take 8 to 12 weeks from start to finish and will use thousands of cans of food to create the towering structures. Built during an eight-hour “Build Day” on Friday, November 13th, the canstructions will be on display in the Prudential Center concourse. The event allows architects and designers to demonstrate their design skills while also providing a service to those in need. Following the exhibitions, the structures will be dismantled and all of the canned food will be donated to charity. Last year, in New Jersey, more than 40,000 pounds of canned food and $6,426 in cash were donated. The call for entries can be found on the AIA New Jersey’s website.